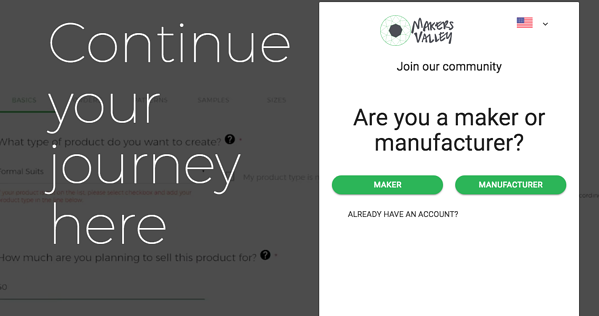 New fashion entrepreneurs can create a login and preview the MakersValley Platform before choosing a subscription plan. Get paired with your very own account manager, and get his or her help anytime while working through the project and the private label clothing manufacturing process. We’ve improved notifications on the Platform dashboard so that things really stand out! Now, the notification bell pulses to alert you about unseen project notifications, and if you’ve missed a message from your Account Manager, the whole project menu will pulse to let you know. Freely browse the Be Inspired Catalog of thousands of white label apparel and apparel accessory samples from our Italian factory-artisan partners. Select and pay for as many samples as you want. Receive your samples in the mail, from Italy. Create a Be Inspired project on the MakersValley Platform. 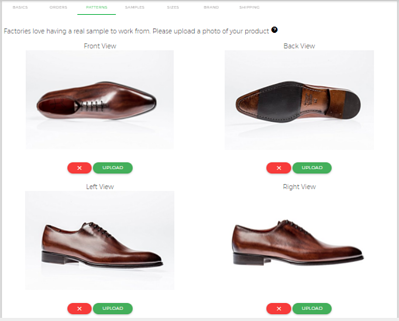 Customize and edit the samples to your liking, until you have the perfect real-life sample of your dreams! Don’t forget to add your brand label and fill out your Be Inspired project with all the details of your modified, white label garment sample. Mail the sample back to us. Submit your project on the Platform to get matched with the manufacturer who will create your final garment product sample and production order. You can now add multiple pictures for trims, fabric, and other details you want to incorporate into your project, plus views of samples from the front, back, left, right, you name it! We want you to be able to give your manufacturer clear instructions so that your dream garment turns out exactly as you planned. Since our Italian manufacturers and artisans send Makers bids to create their garment, we’ve renamed the Offers section of your Platform to “Bids”. The MakersValley Help Center is up and running! Of course, your dedicated account manager will still be there every day to help you, but just in case they aren’t available right at that moment, we now have a searchable Help Center that can walk you through every aspect of managing your factory floor with the MakersValley Platform. We’re still adding more and more help articles, so if you have a question and don’t see the answer, send us a note through the Help Center and we’ll get back to you directly, plus add a new FAQ to the Center so that everyone can enjoy the knowledge and have a better experience. If you’ve got a minute, check it out, and let us know what you think!